← It’s Drink Regional Wine Week! Clovis Point Vineyards in Jamesport on Route 25 was always a vineyard that we would either hit or miss. It has nothing to do with their wines, for some reason we would drive right past it. We have had great times in their tasting room and have always found very nice wines when we visited. Our visits and experiences at Clovis Point were always memorable, however, there was something that just did not make it a destination for us and I really have no answer as to why. That all changed with a bottle of Merlot. 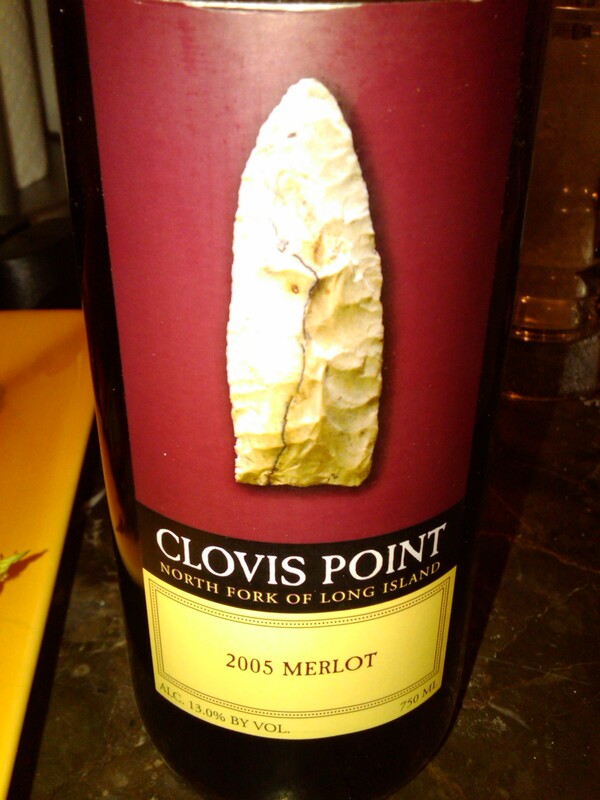 Clovis Point Winery 2005 Merlot ($25) was a memorable wine from a memorable vintage. John Leo, the wine maker at Clovis Point as well as production wine maker at Premium Wine Group, made a fantastic Merlot in 2005 at Clovis Point. A blend of 80% Merlot and 20% Cabernet Franc, it reminds us how great the 2005 vintage was. On the nose aroma‘s of cherry, black cherry, raspberry and juicy plum lead the way with hints of Tobacco, earthy spice like cardamom and clove. Smoky cedar notes are around on this almost sweet-smelling wine, without a hint of sugar. It’s hard to explain, but you just have to trust me (or try it yourself). The juicy ripe fruit that I found on the palate is there, but what leads the way on the palate are some great smoky, earthy flavors with a hint of sweet vanilla, chocolate and cigar box notes. Great vibrant acidity with biting tannins round out this wine. This Merlot was a beautiful wine that had an old world feel to it. If there is any left, make sure to get some, if not, you missed out on a fantastic local wine. This entry was posted in 2005, Clovis Point, Long Island, Merlot. Bookmark the permalink.